On the 25th January 1918 the enemy attacked the British position at Loos. It was on this day that Private Charles Tebbutt was killed in action. Being only eighteen years of age at the time of his death, he was probably another conscript from the 1916 Act1. After joining the army he was posted to the 2nd Battalion Lincolnshire Regiment, and after a short period of training was part of a draft, which landed in France to replace regimental losses. A single man he was killed in action after serving at the front for just over two weeks. He is buried in Fins New British Cemetery, Sorel-Le-Grand, France. Charles was the youngest son of William Tebbutt and his wife Betsy (née Norris), who lived at 83 Gladstone Street, Beeston, Notts. He was born in Chilwell and as a young lad attended the Chilwell National School, and was also an active member of the United Methodist Sunday School. After leaving school he worked in the "Tube" Department at Raleigh Industries on Triumph Road, Lenton, Notts, remaining there until his call-up papers were received. Although William Tebbutt was born in Beeston, he and his wife Betsy (who was born in Harby, Leicstershire) set up home in Chilwell where all of their children were born.William was employed for forty years at the Chilwell Brickyard, working there until he suffered serious injuries as a result of an accident at work, when he was buried in a clay pit when the sides caved in. He then found light work as a winder with the Midland Shawl Company and moved, with his family, to 101 Gladstone Street, Beeston2. Fins New British Cemetery - Fins is a village on the road between Cambrai and Perrone. 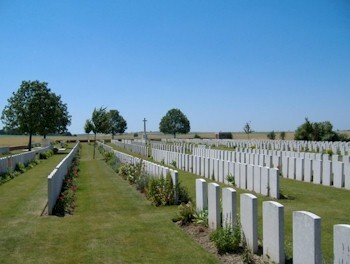 The British Cemetery is a little south-east of the village in the district of Sorel Le Grand. 1The Compulsory Service Act, which came into force on March 2nd 1916. It first applied to single men between the ages of 18 to 41 but was finally extended to married men of the same age groups. 4Army Service Records survive for John James and Harry Tebbutt. Harry attested originally in December 1915. presumably under the terms of the Derby Scheme which provided for such early registration with call-up only if needed. John James Tebbutt (then shown as "Jim" Tebbutt) is shown as living at 93 High Road, Beeston on a next-of-kin declaration for Harry, in November 1919.